One issue has been the common thread over the last six annual industry reports MHI has released with Deloitte over the same number of years—the supply chain workforce. So, it is no surprise that, according to the newly released 2019 MHI Annual Industry Report, 65 percent of the manufacturing and supply chain professionals surveyed said hiring and retaining a skilled workforce is the biggest obstacle impacting their supply chains. And the rise of digital supply chains only exacerbates the workforce issue. Digital supply chains mean more complexity, more data and more change. Technologies like AI, automation, robotics, IIoT and software are supplementing and augmenting human roles in areas such as data analytics, supply chain planning, and order and inventory management. But you have to have a talented, agile workforce to run them. The good news is that digital supply chains help meet the second biggest issue facing supply chain professionals according to the 2019 report, meeting the higher expectations around customer experience that consumers are demanding. For those who invest in digital supply chains and the people who run them, the payoffs will be big. However, companies that fail to acknowledge this trend will miss out on opportunities and risk losing market share, and ultimately could face irrelevance to their customers who will go elsewhere to have their ever-increasing demands met. We have also included detailed information on ProMat 2019, being held in Chicago as you read this. ProMat is where the brightest minds in manufacturing and the supply chain are gathering to discuss the trends of today and the challenges of tomorrow. With 950 exhibits covering 420,000 square feet and more than 140 educational sessions, it’s also where leading companies get reliable information and solid advice about capital expenditures and supply chain investments. When you add in the collocated Automate event, there will be a total of 1,400 exhibitors and 580,000 square feet of exhibits available for ProMat attendees. Many of these investments are among the submissions for the 2019 MHI Innovation Award, which you can view on page 91. The Innovation Award winners will be announced during ProMat during MHI Industry Night on April 10. 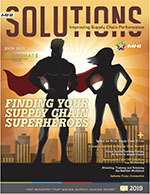 I hope this issue of MHI Solutions helps provide the information and resources you need to address workforce issues to hire and retain your digital supply chain superheroes.